[Fire x Time] Ability to radiate blue flames from her body up to a radius of 5 feet. Granted: [Fire x Time] Ability to radiate blue flames from her body up to a radius of 5 feet. Common NSS Drop || Baby Of Mine Questing for Kitsune with Fire ability, companion. Results - SUCCESS!! Having a guarded personality this mare has been hurt one too many times before. Those of the opposite gender have literally taken everything from this poor girl, so why should she trust them? It will take someone special to allow her to begin to trust again but the chances are pretty good should time be allowed. Before you take the time and effort to get to know her you will find that Brisa will usually appear quiet and wary at first but underneath her shell ,she is a wonderful creature. If you want to meet someone who you could trust with your life, this would be the one to invest your time into. Despite her troubled past she really only wants to find someone to show her the kindness and respect that she has long done without. She hates lying so she will tend to tell the truth about most things and she is very caring of others often placing their needs above her own. Her parents were killed by a band of rogue stallions so Brisa never knew much about her lineage. Her mother carried the appearance of a normal equine but was in fact a unicorn/equine hybrid who by chance never inherited the horn of her father. Brisa's father was a normal equine stallion. Brisa has been alone now for quite some time, always searching for someone to call her friend. Never having been fond of strangers she tries to avoid making contact with them unless its necessary. 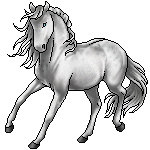 Tragedy struck early on in the young filly's life when a group of rogue stallions attempted to take over her entire herd. All she can remember is the screaming and the bloodshed that blinded her memories at the time. Her mother had done everything in her power to get them out safely but the stallion's were too much. Brisa managed to escape with the help of her mother and the instructions to run, run to find somewhere safe to hide until she came for her. Little did she know at the time that this day would never come. Waiting for days on end it wasn't until the pain of hunger drove her forward away from her home and her family. Before her herd had been desecrated she had enjoyed life as much as any young filly could. Her father had never paid her much attention as he was disappointed that she was not a stallion but her mother was always there for her and she had loved her dearly. Without her there with her now it was still tough to get through but she had to do what was needed to survive. It would have been what her mother would have wanted. So holding her head high she had continued along her path hoping one day to make everything alright again. Months passed along and so did many brutes that chose to do as they wished, her struggles were futile against their pure strength and the cost of running was even more painful. Twice these brutalities ended up taking but ended abruptly only a few months into the pregnancy when her world was ripped away yet again. Since arriving in the Edge she has began to build a better life for herself and is slowly overcoming the many obstacles in her way. With the help of Alysanne and Kahlua she had began to find her true self again and learn to trust others. Things start to hit shaky ground again when her heart tries to open up again to someone new leading into the next major event in her life. Torleik somehow manages to charm the girl and convince her to reveal secrets of her past that nobody else knows. This reveals a moment of temptation and lust that happens for the first time with her permission. When Torleik disappears (allegedly) Brisa falls into a depression thinking that she was stupid to have trusted him if he was just going to walk away on her like this. In her own self pity she meets Note (one of the edges warriors) and spirals into a relationship that goes further than what she had been intending. Feeling a little uncertain with the events she is slightly comforted by Note promising to be there for her no matter what happens in the long run. A few more months pass by and low and behold Brisa finds herself pregnant and alone. Note has disappeared never living up to his promises but the big question remains as to who is the father of her child. Petrified and confused she prays that the black unicorn will turn out to be the father but will know know until her baby is born. Her pregnancy goes by fairly smoothly despite her worries up until the last trimester when she goes searching for Torleik once again to let him know about things. Finding him rather unexpectedly her mood rolls along with the lovely pregnancy mood swings but she manages to tell him that he may be the father. When she finally does give birth she gets the surprise of a lifetime when she discovers that she is carrying twins. 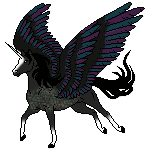 With wings adorning her newborn colt's backs it becomes painfully clear who their father is devastating her and Torleik who was trying to be there for her despite the unknown father fact. She names the colts Aeolus and Levex. Struggling to raise her twin boys on her own without a father is challenging but she does the best that she can while trying to learn how to be a good mother. The big question on her mind is how she is going to explain things to her boys when they get older and begin to ask questions and start trying to fly. This is one thing that she cannot teach them for she has no wings herself. When her colts reach 6 months of age another tragedy strikes when Levex goes missing one night. Despite searching for days on end neither herself or his brother can find out where he went throwing her into another episode of depression as she blames herself for his disappearance. [Earth x Light] Ability to heal through touch giving a gentle warmth through body.